A Socket is a low-level networking primitive. It is a more or less direct mapping of the BSD socket API in a portable GObject based API. It supports both the UNIX socket implementations and winsock2 on Windows. Socket is the platform independent base upon which the higher level network primitives are based. Applications are not typically meant to use it directly, but rather through classes like SocketClient, SocketService and SocketConnection. However there may be cases where direct use of Socket is useful. Socket implements the Initable interface, and since initialization can fail, the constructor may throw an exception. Sockets operate in two general modes, blocking or non-blocking. When in blocking mode all operations block until the requested operation is finished or there is an error. In non-blocking mode all calls that would block return immediately with a Gio::Error::WOULD_BLOCK error. To know when a call would successfully run you can call condition_check(), or condition_wait(). You can also use create_source() and attach it to a Glib::MainContext to get callbacks when I/O is possible. Note that all sockets are always set to non blocking mode in the system, and blocking mode is emulated in Socket. When working in non-blocking mode applications should always be able to handle getting a Gio::Error::WOULD_BLOCK error even when some other function said that I/O was possible. This can easily happen in case of a race condition in the application, but it can also happen for other reasons. For instance, on Windows a socket is always seen as writable until a write returns Gio::Error::WOULD_BLOCK. Sockets can be either connection oriented or datagram based. For connection oriented types you must first establish a connection by either connecting to an address or accepting a connection from another address. For connectionless socket types the target/source address is specified or received in each I/O operation. All socket file descriptors are set to be close-on-exec. Note that creating a Socket causes the signal SIGPIPE to be ignored for the remainder of the program. If you are writing a command-line utility that uses Socket, you may need to take into account the fact that your program will not automatically be killed if it tries to write to stdout after it has been closed. Accept incoming connections on a connection-based socket. This removes the first outstanding connection request from the listening socket and creates a GSocket object for it. The socket must be bound to a local address with g_socket_bind() and must be listening for incoming connections (Socket::listen()). If there are no outstanding connections then the operation will block or throw Gio::Error with ERROR_WOULD_BLOCK if non-blocking I/O is enabled. To be notified of an incoming connection, wait for the Glib::IO_IN condition. When a socket is created it is attached to an address family, but it doesn't have an address in this family. Socket::bind() assigns the address (sometimes called name) of the socket. It is generally required to bind to a local address before you can receive connections. (See Socket::listen() and Socket::accept()). In certain situations, you may also want to bind a socket that will be used to initiate connections, though this is not normally required. address a SocketAddress specifying the local address. Checks and resets the pending connect error for the socket. This is used to check for errors when g_socket_connect() is used in non-blocking mode. Closes the socket, shutting down any active connection. Closing a socket does not wait for all outstanding I/O operations to finish, so the caller should not rely on them to be guaranteed to complete even if the close returns with no error. Once the socket is closed, all other operations will return Gio::Error::CLOSED. Closing a socket multiple times will not return an error. Sockets will be automatically closed when the last reference is dropped, but you might want to call this function to make sure resources are released as early as possible. Checks on the readiness of socket to perform operations. The operations specified in condition are checked for and masked against the currently-satisfied conditions on socket. The result is returned. Note that on Windows, it is possible for an operation to return Gio::Error::WOULD_BLOCK even immediately after g_socket_condition_check() has claimed that the socket is ready for writing. Rather than calling g_socket_condition_check() and then writing to the socket if it succeeds, it is generally better to simply try writing to the socket right away, and try again later if the initial attempt returns Gio::Error::WOULD_BLOCK. It is meaningless to specify Glib::IOCondition::ERR or Glib::IOCondition::HUP in condition; these conditions will always be set in the output if they are true. condition A IOCondition mask to check. The GIOCondition mask of the current state. Waits for up to timeout microseconds for condition to become true on socket. If the condition is met, true is returned. If cancellable is cancelled before the condition is met, or if timeout (or the socket's Socket::property_timeout()) is reached before the condition is met, then false is returned and error, if non-nullptr, is set to the appropriate value (Gio::Error::CANCELLED or Gio::Error::TIMED_OUT). Note that although timeout is in microseconds for consistency with other GLib APIs, this function actually only has millisecond resolution, and the behavior is undefined if timeout is not an exact number of milliseconds. condition A IOCondition mask to wait for. timeout The maximum time (in microseconds) to wait, or -1. Waits for condition to become true on socket. When the condition is met, true is returned. If cancellable is cancelled before the condition is met, or if the socket has a timeout set and it is reached before the condition is met, then false is returned and error, if non-nullptr, is set to the appropriate value (Gio::Error::CANCELLED or Gio::Error::TIMED_OUT). Connect the socket to the specified remote address. For connection oriented socket this generally means we attempt to make a connection to the address . For a connection-less socket it sets the default address for Socket::send() and discards all incoming datagrams from other sources. Generally connection oriented sockets can only connect once, but connection-less sockets can connect multiple times to change the default address. If the connect call needs to do network I/O it will block, unless non-blocking I/O is enabled. Then Gio::Error with ERROR_PENDING is thrown and the user can be notified of the connection finishing by waiting for the Glib::IO_OUT condition. The result of the connection must then be checked with Socket::check_connect_result(). address a SocketAddress specifying the remote address. Creates a new Socket with the defined family, type and protocol. If protocol is 0 (Gio::Socket::Protocol::DEFAULT) the default protocol type for the family and type is used. The protocol is a family and type specific int that specifies what kind of protocol to use. Gio::Socket::Protocol lists several common ones. Many families only support one protocol, and use 0 for this, others support several and using 0 means to use the default protocol for the family and type. The protocol id is passed directly to the operating system, so you can use protocols not listed in Gio::Socket::Protocol if you know the protocol number used for it. family The socket family to use, e.g. Gio::SocketFamily::IPV4. type The socket type to use. protocol The id of the protocol to use, or 0 for default. A Socket or nullptr on error. 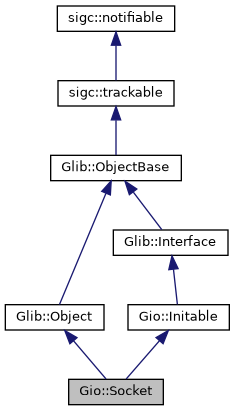 Free the returned object with Glib::object_unref(). Creates a new Socket from a native file descriptor or winsock SOCKET handle. This reads all the settings from the file descriptor so that all properties should work. Note that the file descriptor will be set to non-blocking mode, independent on the blocking mode of the Socket. On success, the returned Socket takes ownership of fd. On failure, the caller must close fd themselves. fd A native socket file descriptor. Creates a SocketSource that can be attached to a Glib::MainContext to monitor for the availability of the specified condition on the socket. Create a slot from a function to be called when condition is met for the socket with sigc::ptr_fun() or sigc::mem_fun() and pass it into the connect() function of the returned SocketSource object. Polling of the socket will start when you attach a Glib::MainContext object to the returned SocketSource object using its attach() function. It is meaningless to specify Glib::IO_ERR or Glib::IO_HUP in condition; these conditions will always be reported output if they are true. cancellable can be used to cancel the source, which will cause the source to trigger, reporting the current condition (which is likely 0 unless cancellation happened at the same time as a condition change). You can check for this in the callback using Cancellable::is_cancelled(). If the socket has a timeout set, and it is reached before condition occurs, the source will then trigger anyway, reporting Glib::IO_IN or Glib::IO_OUT depending on condition. However, the socket will have been marked as having had a timeout, and so the next Socket I/O method you call will then fail with a Gio::IO_ERROR_TIMED_OUT. Gio::signal_socket().connect() is a simpler interface to the same functionality. condition A Glib::IOCondition mask to monitor. cancellable A Cancellable. The default value means the source is not cancellable. Get the amount of data pending in the OS input buffer, without blocking. If socket is a UDP or SCTP socket, this will return the size of just the next packet, even if additional packets are buffered after that one. Note that on Windows, this function is rather inefficient in the UDP case, and so if you know any plausible upper bound on the size of the incoming packet, it is better to just do a g_socket_receive() with a buffer of that size, rather than calling g_socket_get_available_bytes() first and then doing a receive of exactly the right size. The number of bytes that can be read from the socket without blocking or truncating, or -1 on error. Gets the blocking mode of the socket. For details on blocking I/O, see g_socket_set_blocking(). true if blocking I/O is used, false otherwise. Gets the broadcast setting on socket; if true, it is possible to send packets to broadcast addresses. The broadcast setting on socket. Returns the credentials of the foreign process connected to this socket, if any (e.g. it is only supported for Gio::SocketFamily::UNIX sockets). If this operation isn't supported on the OS, the method fails with the Gio::Error::NOT_SUPPORTED error. On Linux this is implemented by reading the SO_PEERCRED option on the underlying socket. Other ways to obtain credentials from a foreign peer includes the UnixCredentialsMessage type and g_unix_connection_send_credentials() / g_unix_connection_receive_credentials() functions. nullptr if error is set, otherwise a Credentials object that must be freed with Glib::object_unref(). Gets the socket family of the socket. Returns the underlying OS socket object. On unix this is a socket file descriptor, and on Windows this is a Winsock2 SOCKET handle. This may be useful for doing platform specific or otherwise unusual operations on the socket. Gets the keepalive mode of the socket. For details on this, see g_socket_set_keepalive(). true if keepalive is active, false otherwise. Gets the listen backlog setting of the socket. For details on this, see g_socket_set_listen_backlog(). Try to get the local address of a bound socket. This is only useful if the socket has been bound to a local address, either explicitly or implicitly when connecting. A SocketAddress or nullptr on error. Free the returned object with Glib::object_unref(). Gets the multicast loopback setting on socket; if true (the default), outgoing multicast packets will be looped back to multicast listeners on the same host. The multicast loopback setting on socket. Gets the multicast time-to-live setting on socket; see g_socket_set_multicast_ttl() for more details. The multicast time-to-live setting on socket. Gets the value of an integer-valued option on socket, as with getsockopt(). The [<gio/gnetworking.h>][gio-gnetworking.h] header pulls in system headers that will define most of the standard/portable socket options. For unusual socket protocols or platform-dependent options, you may need to include additional headers. Note that even for socket options that are a single byte in size, value is still a pointer to a int variable, not a #guchar; g_socket_get_option() will handle the conversion internally. level The "API level" of the option (eg, SOL_SOCKET). optname The "name" of the option (eg, SO_BROADCAST). value Return location for the option value. Success or failure. On failure, error will be set, and the system error value (errno or WSAGetLastError()) will still be set to the result of the getsockopt() call. Gets the socket protocol id the socket was created with. In case the protocol is unknown, -1 is returned. A protocol id, or -1 if unknown. Try to get the remote address of a connected socket. This is only useful for connection oriented sockets that have been connected. Gets the socket type of the socket. Gets the timeout setting of the socket. For details on this, see g_socket_set_timeout(). Gets the unicast time-to-live setting on socket; see g_socket_set_ttl() for more details. The time-to-live setting on socket. Checks whether a socket is closed. true if socket is closed, false otherwise. Check whether the socket is connected. This is only useful for connection-oriented sockets. If using g_socket_shutdown(), this function will return true until the socket has been shut down for reading and writing. If you do a non-blocking connect, this function will not return true until after you call g_socket_check_connect_result(). true if socket is connected, false otherwise. Registers socket to receive multicast messages sent to group. socket must be a Gio::Socket::Type::DATAGRAM socket, and must have been bound to an appropriate interface and port with g_socket_bind(). If iface is nullptr, the system will automatically pick an interface to bind to based on group. If source_specific is true, source-specific multicast as defined in RFC 4604 is used. Note that on older platforms this may fail with a Gio::Error::NOT_SUPPORTED error. To bind to a given source-specific multicast address, use g_socket_join_multicast_group_ssm() instead. group A InetAddress specifying the group address to join. iface Name of the interface to use, or nullptr. source_specific true if source-specific multicast should be used. Removes socket from the multicast group defined by group, iface, and source_specific (which must all have the same values they had when you joined the group). socket remains bound to its address and port, and can still receive unicast messages after calling this. To unbind to a given source-specific multicast address, use g_socket_leave_multicast_group_ssm() instead. group A InetAddress specifying the group address to leave. source_specific true if source-specific multicast was used. Marks the socket as a server socket - a socket that is used to accept incoming requests using Socket::accept(). Before calling this the socket must be bound to a local address using Socket::bind(). To set the maximum amount of outstanding clients, use Socket::set_listen_backlog(). Whether or not I/O on this socket is blocking. Whether the socket should allow sending to broadcast addresses. Keep connection alive by sending periodic pings. Outstanding connections in the listen queue. The local address the socket is bound to. Whether outgoing multicast packets loop back to the local host. Time-to-live out outgoing multicast packets. The id of the protocol to use, or -1 for unknown. The remote address the socket is connected to. The timeout in seconds on socket I/O. Time-to-live for outgoing unicast packets. Receive data (up to size bytes) from a socket. This is mainly used by connection-oriented sockets; it is identical to g_socket_receive_from() with address set to nullptr. For Gio::Socket::Type::DATAGRAM and Gio::Socket::Type::SEQPACKET sockets, g_socket_receive() will always read either 0 or 1 complete messages from the socket. If the received message is too large to fit in buffer, then the data beyond size bytes will be discarded, without any explicit indication that this has occurred. For Gio::Socket::Type::STREAM sockets, g_socket_receive() can return any number of bytes, up to size. If more than size bytes have been received, the additional data will be returned in future calls to g_socket_receive(). If the socket is in blocking mode the call will block until there is some data to receive, the connection is closed, or there is an error. If there is no data available and the socket is in non-blocking mode, a Gio::Error::WOULD_BLOCK error will be returned. To be notified when data is available, wait for the Glib::IOCondition::IN condition. buffer A buffer to read data into (which should be at least size bytes long). size The number of bytes you want to read from the socket. Number of bytes read, or 0 if the connection was closed by the peer, or -1 on error. This behaves exactly the same as g_socket_receive(), except that the choice of blocking or non-blocking behavior is determined by the blocking argument rather than by socket's properties. blocking Whether to do blocking or non-blocking I/O. Tries to send size bytes from buffer on the socket. This is mainly used by connection-oriented sockets; it is identical to g_socket_send_to() with address set to nullptr. buffer The buffer containing the data to send. size The number of bytes to send. Number of bytes written (which may be less than size), or -1 on error. Tries to send size bytes from buffer to address. If address is nullptr then the message is sent to the default receiver (set by g_socket_connect()). See g_socket_send() for additional information. This behaves exactly the same as g_socket_send(), except that the choice of blocking or non-blocking behavior is determined by the blocking argument rather than by socket's properties. Sets the blocking mode of the socket. In blocking mode all operations (which don’t take an explicit blocking parameter) block until they succeed or there is an error. In non-blocking mode all functions return results immediately or with a Gio::Error::WOULD_BLOCK error. All sockets are created in blocking mode. However, note that the platform level socket is always non-blocking, and blocking mode is a GSocket level feature. blocking Whether to use blocking I/O or not. Sets whether socket should allow sending to broadcast addresses. This is false by default. broadcast Whether socket should allow sending to broadcast addresses. Sets or unsets the SO_KEEPALIVE flag on the underlying socket. When this flag is set on a socket, the system will attempt to verify that the remote socket endpoint is still present if a sufficiently long period of time passes with no data being exchanged. If the system is unable to verify the presence of the remote endpoint, it will automatically close the connection. The exact time between pings is system- and protocol-dependent, but will normally be at least two hours. Most commonly, you would set this flag on a server socket if you want to allow clients to remain idle for long periods of time, but also want to ensure that connections are eventually garbage-collected if clients crash or become unreachable. keepalive Value for the keepalive flag. Sets the maximum number of outstanding connections allowed when listening on this socket. If more clients than this are connecting to the socket and the application is not handling them on time then the new connections will be refused. Note that this must be called before g_socket_listen() and has no effect if called after that. backlog The maximum number of pending connections. Sets whether outgoing multicast packets will be received by sockets listening on that multicast address on the same host. loopback Whether socket should receive messages sent to its multicast groups from the local host. Sets the time-to-live for outgoing multicast datagrams on socket. By default, this is 1, meaning that multicast packets will not leave the local network. ttl The time-to-live value for all multicast datagrams on socket. Sets the value of an integer-valued option on socket, as with setsockopt(). value The value to set the option to. Success or failure. On failure, error will be set, and the system error value (errno or WSAGetLastError()) will still be set to the result of the setsockopt() call. Sets the time in seconds after which I/O operations on socket will time out if they have not yet completed. On a blocking socket, this means that any blocking Socket operation will time out after timeout seconds of inactivity, returning Gio::Error::TIMED_OUT. On a non-blocking socket, calls to g_socket_condition_wait() will also fail with Gio::Error::TIMED_OUT after the given time. Sources created with g_socket_create_source() will trigger after timeout seconds of inactivity, with the requested condition set, at which point calling g_socket_receive(), g_socket_send(), g_socket_check_connect_result(), etc, will fail with Gio::Error::TIMED_OUT. If timeout is 0 (the default), operations will never time out on their own. Note that if an I/O operation is interrupted by a signal, this may cause the timeout to be reset. timeout The timeout for socket, in seconds, or 0 for none. Sets the time-to-live for outgoing unicast packets on socket. By default the platform-specific default value is used. ttl The time-to-live value for all unicast packets on socket. Shut down part or all of a full-duplex connection. If shutdown_read is true then the receiving side of the connection is shut down, and further reading is disallowed. If shutdown_write is true then the sending side of the connection is shut down, and further writing is disallowed. It is allowed for both shutdown_read and shutdown_write to be true. One example where it is useful to shut down only one side of a connection is graceful disconnect for TCP connections where you close the sending side, then wait for the other side to close the connection, thus ensuring that the other side saw all sent data. shutdown_read Whether to shut down the read side. shutdown_write Whether to shut down the write side. Checks if a socket is capable of speaking IPv4. IPv4 sockets are capable of speaking IPv4. On some operating systems and under some combinations of circumstances IPv6 sockets are also capable of speaking IPv4. See RFC 3493 section 3.7 for more information. No other types of sockets are currently considered as being capable of speaking IPv4. true if this socket can be used with IPv4.